I stated in my last blog that telesales was a numbers game. But that isn’t really the whole story. In fact some experts would argue that selling is not a numbers game; it’s a ratios game. It’s about the ratio of dials you make to sales or appointments you set. The ratios tell you how productive you are and once you know your ratios you know how hard you need to work to achieve a desired result. 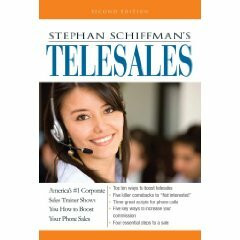 In Stephan Schiffman book, Telesales he talks about the five ways you can increase your income. We will look at these in the next blog but before you can do this you need to measure the following items: dials, discussions, presentations, and sales. In this case a “dial” is the number of calls you make that get answered by someone. A “discussion” is when you have a conversation with someone who could actually buy the product or service from you. A “presentation” is what happens when you make a recommendation to a decision-maker and a “sale”, of course, is when someone buys your product or service. It is a good idea to draw up columns with these headings on a piece of paper or in a notebook and then under the columns draw rows for each of the hours of your calling day. Now track your calls through the day with a tic mark in the appropriate column/hour. Do this for at least a few days if not a week or so. If you can, make it an on going habit to track these results. One benefit of doing this is that you can see what hours during the day give you the best outcome. Do you see a recurring pattern? Are there certain times of the day where you have a higher number of presentations or sales? If so is it a reflection of the way you are working, or is it that the market you are calling has good and bad times to receive calls? If you suspect you may not be performing so well at a certain time of the day think about ways to improve this. Perhaps recording your calls at different times of the day and then listening to them may give you some clues as to what needs changing. Start tracking these statistics and in the next blog I will talk about how you can increase your income by knowing your ratios.